Is WGS84 itself a Coordinate Reference System? I was wondering the difference between WGS84 and EPSG:4326 (see this). The things to note here are that 4326 refers to a Geodetic CRS (i.e. it uses latitude and longitude as coordinate units). It is made up of the WGS84 Geodetic Datum (EPSG:6326) and an ellipsoidal coordinate system (EPSG:6422). The datum itself is made up of the WGS84 ellipsoid, and a prime meridian. These are the SRS components. So you can see in this instance, WGS84 could refer to three different things! But EPSG:4326 is unambiguous. 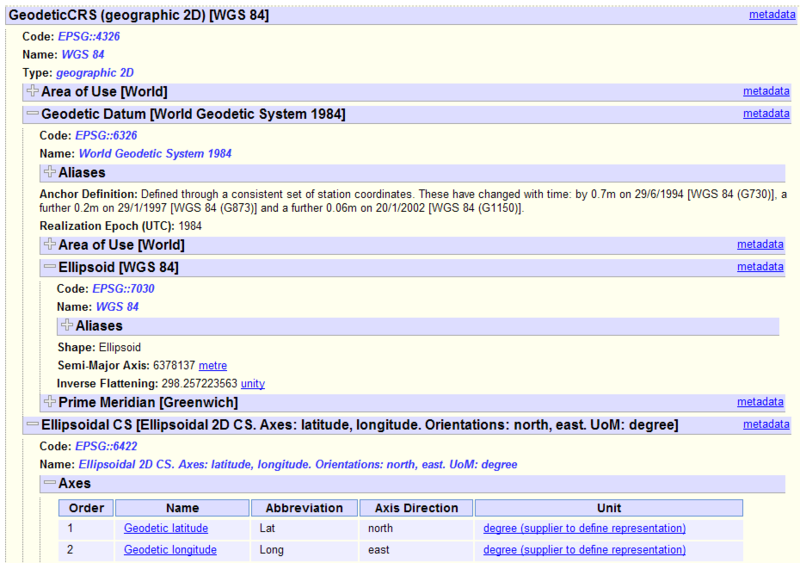 The beauty of this system is that other geodetic CRSes can be defined in terms of EPSG:6422 (Ellipsoidal CS) and we'd always know it refers to an North/East longitude/latitude coordinate system. Here you can see that it uses the WGS84 CRS as its base coordinate reference system, then defines the type of projection, its origin, and its false eastings and northings. So it can be viewed as a kind of "wrapper" around EPSG:4326, which is already well defined. It would be possible, for instance, to use the same projection parameters but a different geodetic CRS such as OSGB 1936 (EPSG:4277), which will define a valid coordinate system but one that would be of less use to other users. These sort of ad-hoc CRSes tend to be given high EPSG numbers, and often are just bogus ones invented for a specific use and not officially adopted by the EPSG. EPSG:900913 (Google's Web Mercator) was like this, until it was adopted as EPSG:3857. Not the answer you're looking for? 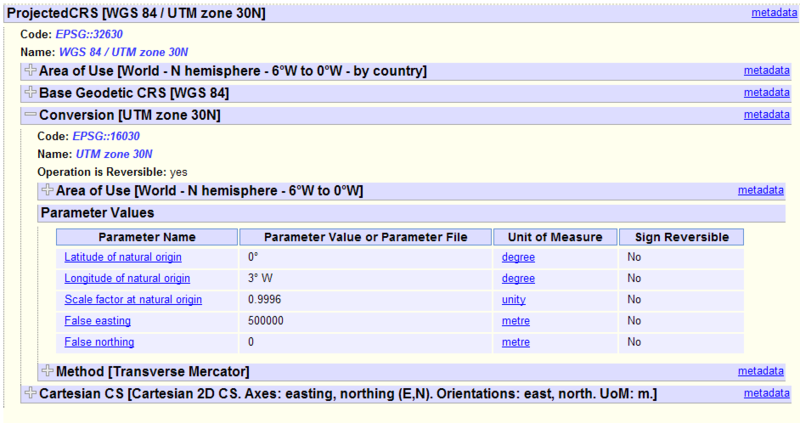 Browse other questions tagged coordinate-system coordinates datum or ask your own question. Difference between WGS84 and EPSG:4326? What is the Difference between Geometric and Geographic columns? Is NAD 83 the same as EPSG:4326? How to convert NAV4 coordinate system to WGS84? Defining coordinate reference system with rotation in GeoServer? Is WGS 84 datum, coordinate reference system, or both? Resetting database coordinate reference system in QGIS Midvatten plugin? What does it mean to reproject a satellite image from utm (zone 13N) to wgs84?